The Chadds Ford studio where Andrew Wyeth, one of America’s most significant artists, painted many of his most important works of art, opened for tours. Given to the Brandywine Conservancy by the artist’s wife, Betsy James Wyeth, the studio has undergone careful restoration to preserve its appearance when it was used by the late artist. The Andrew Wyeth gallery located in the Brandywine River Museum features A Painter’s View: The Andrew Wyeth Studio. On display through October 28, 2012, this exhibition features the artist’s own view of his studio in paintings and drawings lent from private collections. These works, created between 1943 and 2005, reflect the artist’s interest in the building’s spare and aged interior and reveal informal moments with individuals who often posed there. Of the approximately 20 paintings on display, half have never before been on view to the public. The gallery also includes many of the artist’s major works painted in the studio over his 70-year career.Starting this summer, art lovers can tour the Brandywine Valley studio where Andrew Wyeth worked. It took the Brandywine Conservancy a year to clean up the old house where Andrew Wyeth painted from 1940 until 2008, and starting this summer, people can purchase timed tickets to view the space. Frolic Weymouth, Conservancy Founder, says the structure–which was built in 1875–was a mess. The roof and chimney were falling in, and it needed a lot of TLC, but it was worth it. “Wyeth is one of the most important painters in American history, and people want to see that. Once you go to it and see how he works, you have a much better understanding of his work,” Weymouth explains. Andrew Newell Wyeth (July 12, 1917 – January 16, 2009) was a visual artist, primarily a realist painter, working predominantly in a regionalist style. He was one of the best-known U.S. artists of the middle 20th century. In his art, Wyeth’s favorite subjects were the land and people around him, both in his hometown of Chadds Ford, Pennsylvania, and at his summer home in Cushing, Maine. 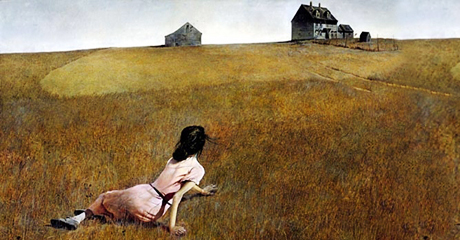 One of the most well-known images in 20th-century American art is his painting, Christina’s World, currently in the collection of the Museum of Modern Art in New York City. Wyeth started drawing at a young age. He was a draftsman before he could read. By the time he was a teenager, his father brought him into his studio for the only art lessons he ever had. N.C. inspired his son’s love of rural landscapes, sense of romance and artistic traditions. Although creating illustrations was not a passion he wished to pursue, Wyeth produced illustrations under his father’s name while in his teens. With his father’s guidance, he mastered figure study and watercolor, and later learned egg tempera from his brother-in-law Peter Hurd. He studied art history on his own, admiring many masters of Renaissance and American painting, especially Winslow Homer. In the same letter N.C. correlates being a great man with being a great painter: To be a great artist, he described, requires emotional depth, an openness, to look beyond self to the subject, and passion. A great painting then is one that enriches and broadens one’s perspective. In October 1945, his father and his three-year-old nephew, Newell Convers Wyeth II (b. 1941), were killed when their car stalled on railroad tracks near their home and was struck by a train. Wyeth referred to his father’s death as a formative emotional event in his artistic career, in addition to being a personal tragedy. Shortly afterwards, Wyeth’s art consolidated into his mature and enduring style. The studio is down the road from the Brandywine River Museum in Chadds Ford, and visitors are able to see it.